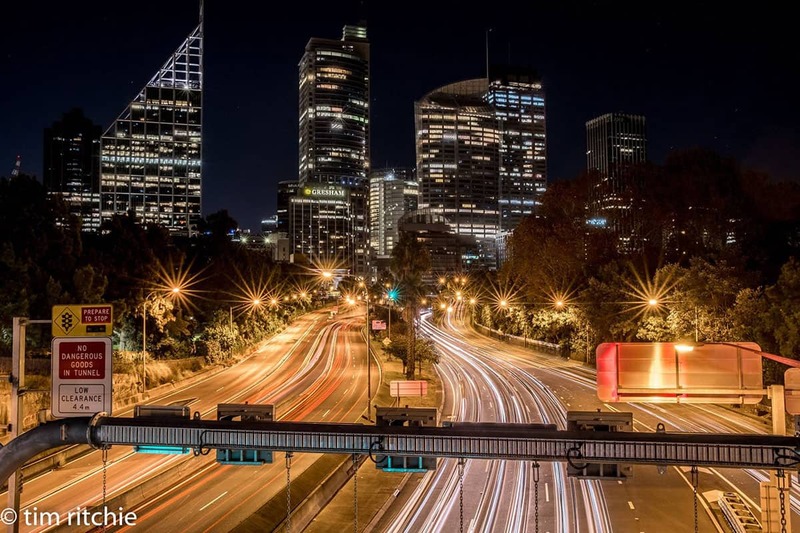 Have you ever ‘ooh’ed’ and ‘ahh’ed’ at photos that show the movement of traffic on a busy street at night? 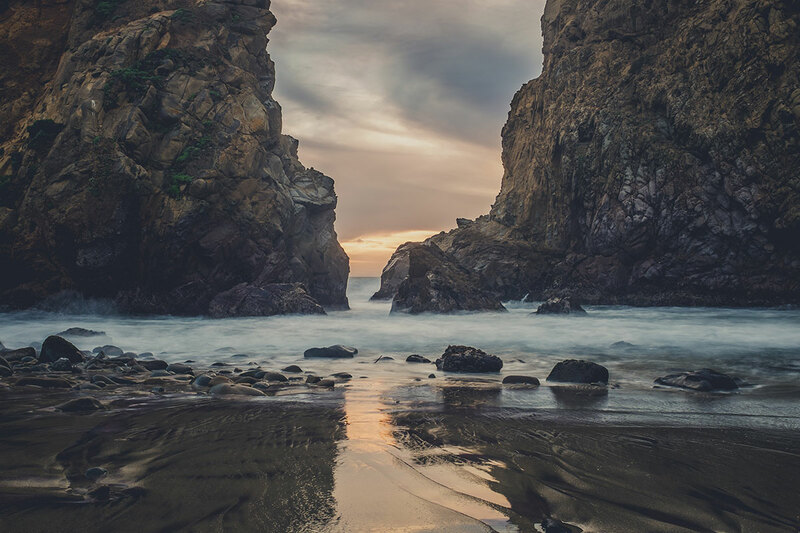 Marveled at how the water in seascapes and waterfalls looks soft and dream-like in certain images? Or maybe you’ve gasped at the images of fireworks captured in the night sky? None of these cool effects are photoshop magic! 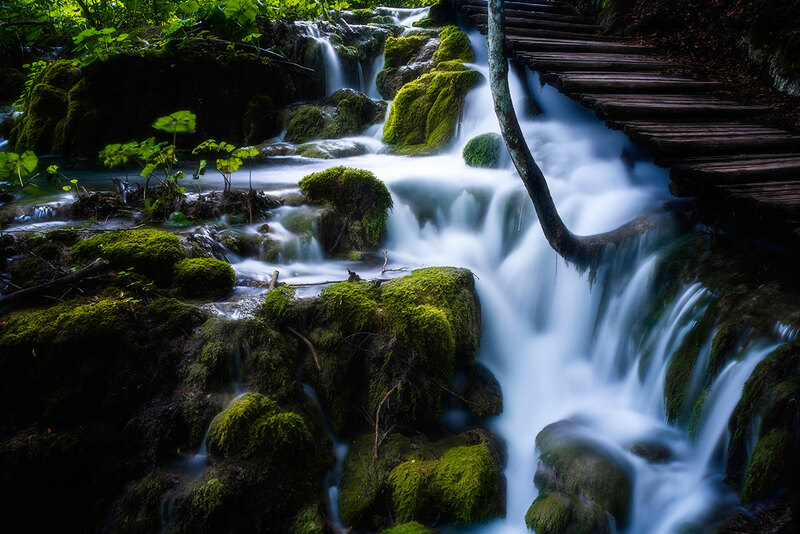 Capturing images like these are all about slowing down your camera’s shutter speed to the point you can capture motion. And it’s easy to do! Even if you’re a brand new photographer, this is a technique you can easily learn. Here are some tips and tricks to get started. When you want to show motion show in your images, use a tripod whenever shooting at shutter speeds below 1/60 of a second. Most of us cannot physically hold the camera steady at shutter speeds below 1/60. So dust off that tripod! Note: when shooting on a tripod, always turn image stabilization (aka vibration reduction) off. Leaving image stabilization turned on while the camera is on the tripod can pick up the vibration caused by the image stabilization feature itself. Once you do this, you won’t need to touch your ISO setting again during your shoot. Your camera will automatically calculate the correct ISO based on your shutter speed and aperture settings. Step 3: Put your camera in shutter priority mode. All DSLR and mirrorless cameras that aren’t point-and-shoot cameras have a shooting mode called Shutter Priority. This mode is a semi-automatic mode that is ideal for new photographers to experiment with changing their shutter speeds. In this mode, your camera automatically adjusts the size of your lens’ aperture so that your image doesn’t become overexposed. All you need to do is change your shutter speed setting, and the camera takes care of the rest. It’s very simple to set your camera into Shutter Priority mode. 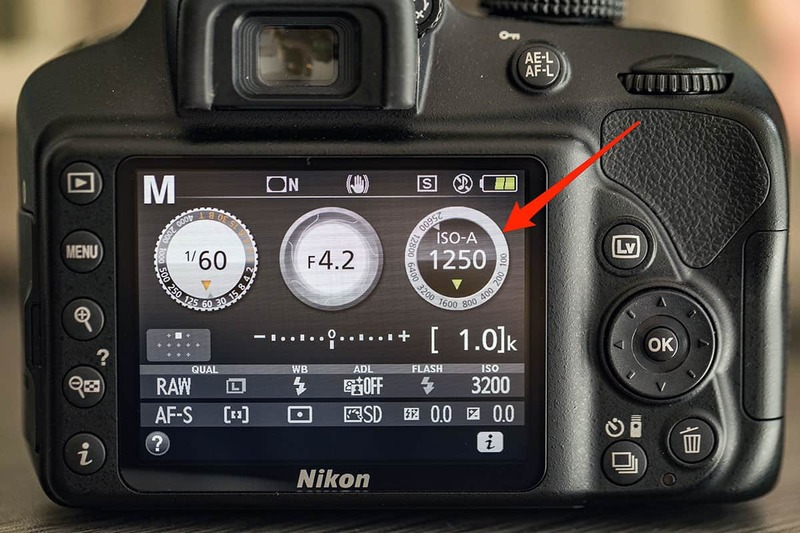 For Nikon and Sony users, simply turn your mode dial to ‘S’ to select Shutter Priority. 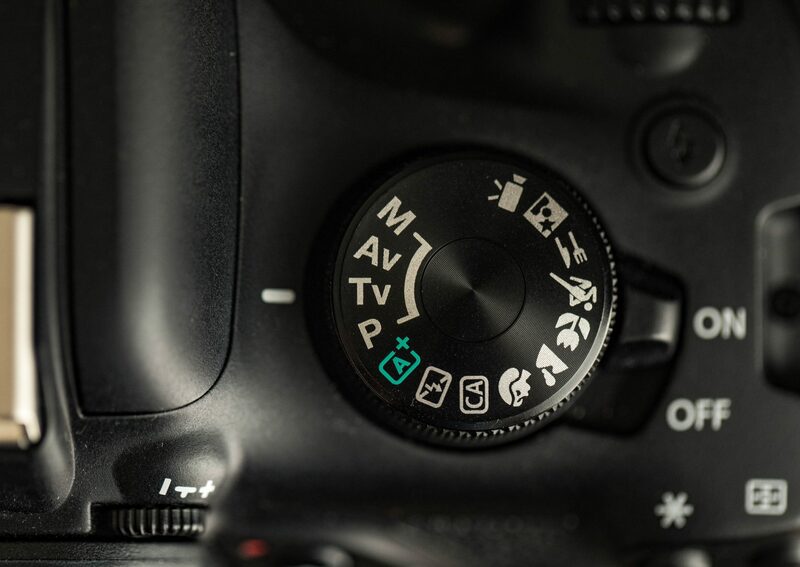 Canon cameras have also this mode, but Canon doesn’t use ‘S’ to denote shutter speed. Instead, turn your camera’s mode dial to TV. This stands for ‘time-value’ or the length of time the shutter stays open. This setting is exactly the same as Shutter Priority mode on the other cameras. You’ll have to experiment a bit with your shutter speeds to get the effect you want – and of course, your settings will depend on the speed of your subject. Lighting conditions play a big part in selecting the right shutter speed, as bright conditions call for a faster shutter speed. Here are some suggested shutter speeds to start you out. Start out with a shutter speed of 2 seconds. Experiment with reducing your shutter speed down to 8 seconds. 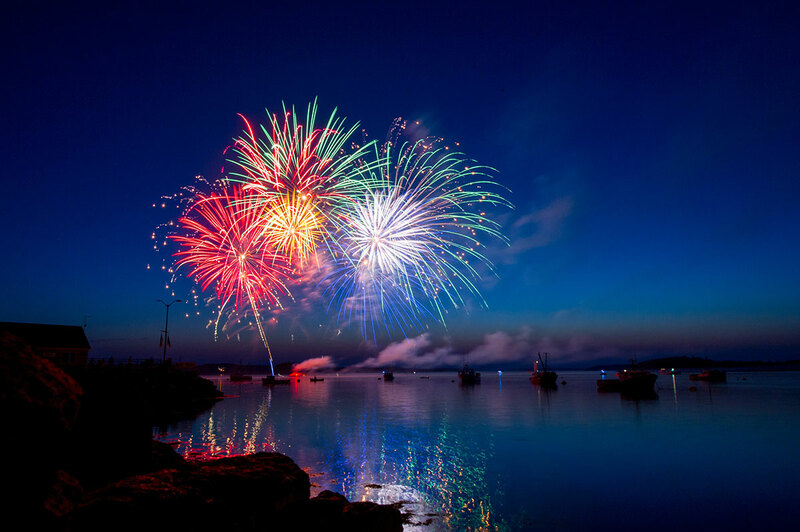 For the best fireworks images, get your shots in early in the show. The longer the fireworks show lasts, the more the sky fills with smoke. Fireworks images look best when the fireworks are contrasted against a clear sky. 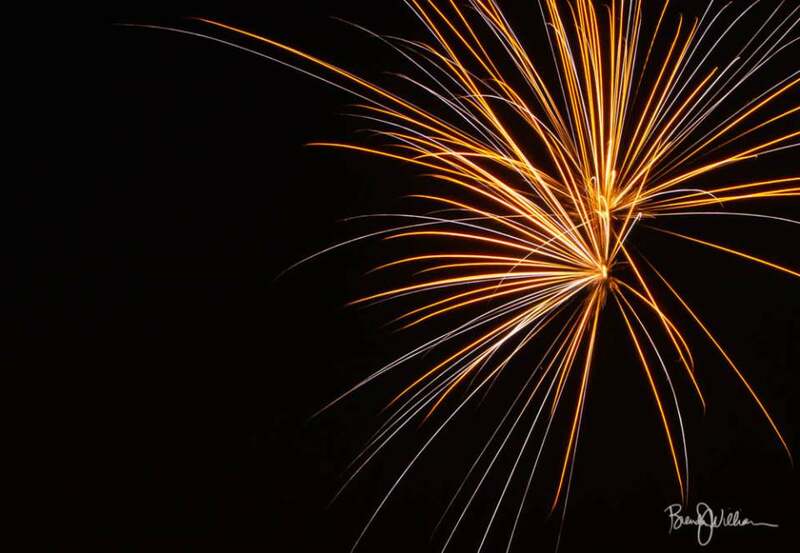 For detailed instructions, check out this post on how to perfectly capture fireworks. 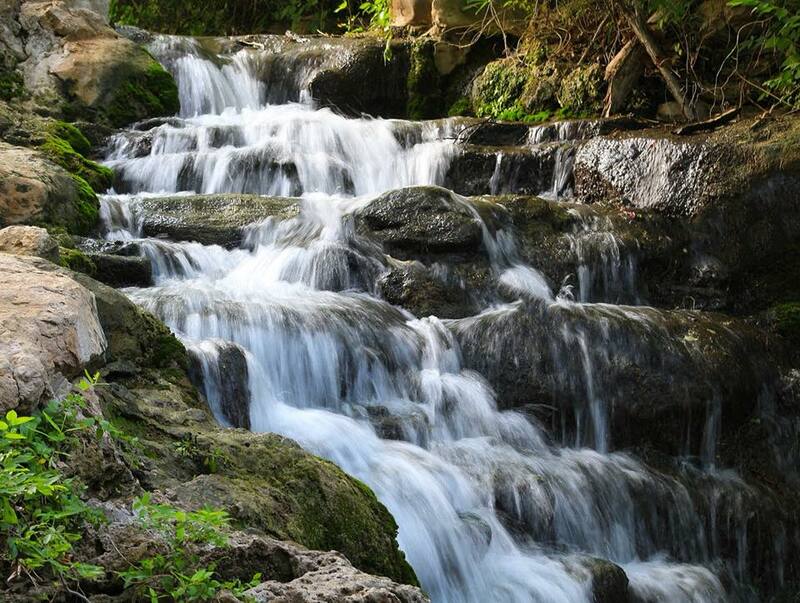 If you’d like to capture the movement of a waterfall and create a soft, dreamy effect in your photo, try a starting shutter speed of two seconds. If you keep getting ‘too bright’ warnings, add a neutral density filter to your lens. A neutral density filter acts like sunglasses for your lens and allows you to keep the shutter open longer without overexposing your image. In a pinch, try using a polarizing filter. It won’t be as effective to reduce the light as much as the N.D. filter is, but it’s still better than nothing. The same techniques used in capturing waterfalls are also used for seascape photography. Start with a shutter speed of two seconds. Use a neutral density or polarizing filter if needed. To capture the movement of tail lights at night, start out with a shutter speed of 10 seconds. Experiment with leaving your shutter open up to 30 seconds to capture different effects. If you’re looking for more dramatic action shots, try panning. 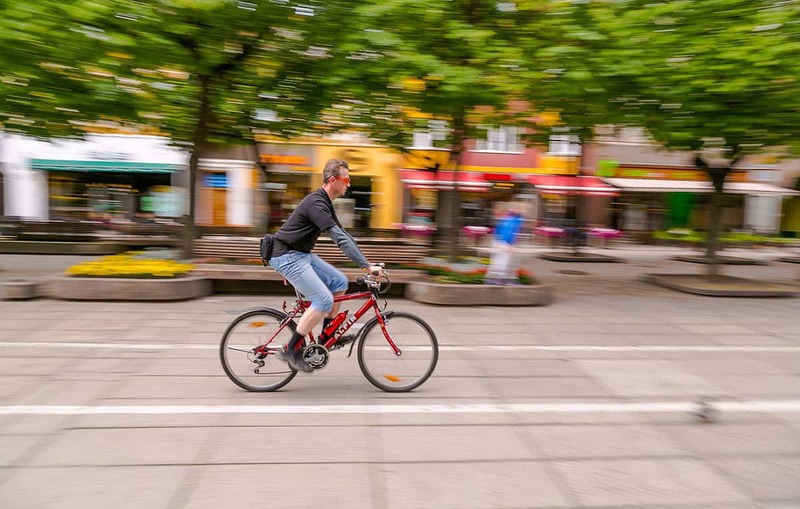 Panning gives the effect of a moving subject in sharp focus with a blurred background, This effect is created by moving your camera along with the subject as they pass by. It can be challenging to nail the technique, but well worth practicing. Set your camera in shutter priority mode. The speed you choose depends on the speed of the subject. You’ll need to experiment a bit to get the right shutter speed, but here are are some starting points to try. Cyclists – 1/60 of a second. This autofocus mode automatically adjusts focus for moving subjects. For best results, combine AF-C mode with the dynamic area setting. This allows you to focus on a single point, and the camera makes adjustments as the subject moves. Frame your subject as they come into view then partially depress your shutter to activate autofocus. Smoothly follow your subject right to left or left to right as they move past you. You may need to experiment a bit with these suggested shutter speeds. If your subject looks blurry, increase your shutter speed until you get the results you want. Have fun and experiment with shutter speed for more creative photos! Ready to take your photos to the next level? Join me for my free training called “Show Your Camera Who’s Boss” and I’ll show you how to use the dials on your camera to freeze motion. Thank you so much! I have had my camera for a couple of years and never seem to make the time to figure it out the correct way. I love to take pictures. Thanks to Dave I will be able to take much better pictures and maybe be able to take others pictures. I have a lot of fun with graduation pics. Thank you, David for yet another wonderful article. I’ve ‘attended’ several of your online teaching sessions and read quite a number of your articles, and even though I’ve been a photographer for more than 40 years now, I can honestly say that I’m continually ‘picking up’ new ideas from you, or I’ve developed additional ways of ‘looking’ at things. In my humble opinion, you ‘have a way’ of putting things across that makes your teaching method(s) advantageous to beginners and ‘old uns’ alike. For night shots. I’m noticing the lower the ISO, the higher the aperture. Is this the correct correlation? Hi Sasha! Great question! If you use a lower ISO, higher number aperture, you’ll want to use a longer shutter speed to catch that nice movement! This is great I’m a noob and have always taken wonderful pics with point and shoot cameras… Now I’m starting to get the hang of DSLR’s!!! These mini “classes” Are great!! Hi Kristine! Thank you for your comment! So glad you are finding benefit from them! I believe in you! This is a great article! I learned a lot and can’t wait to try it! Way to break it down and make it make sense! Thanks! Glad to hear you are excited, Linda! Thank you!! I have always wondered how people take those beautiful waterfall pics. I knew it had something to do with the shutter speed, but I couldn’t figure out what to do with the rest of the camera. Now I have a good idea, and I’ll be trying out your tips soon. Thank you, David! Hi Glenda! Thank you! So glad to hear you have benefited from the blog post in a great way! I believe in you Glenda! Hi Mick! You’re awesome. Thank you for your kind words – We love feedback! I’m so glad that you have benefitted from the teaching in such an outstanding way. 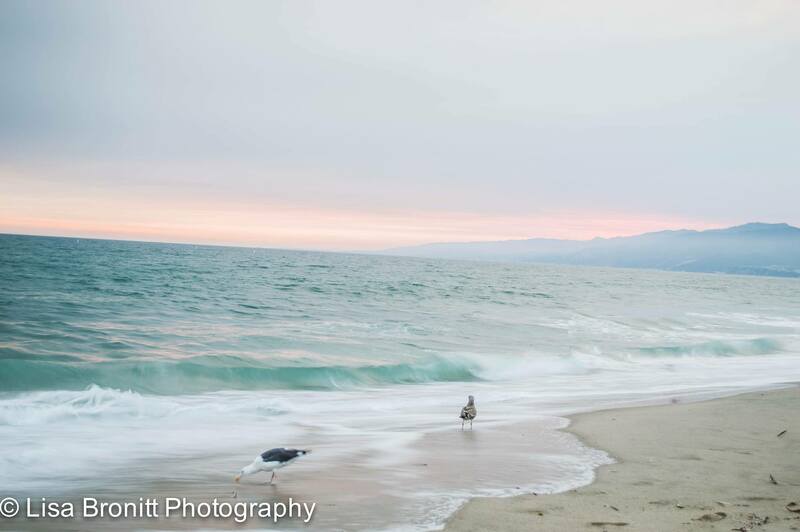 I look forward to your photography journey developing and growing over time! Have a great day Mick! Thank you for short STEP BY STEP instructions!! You’re so welcome Robbie! Happy to help! Loving the result focused mini training! Just the right amount of information to be able to review, process, understand, and add to my memory bank. It printed out great to add to my knowledge binder. It also gave me some inspiration to try something outside my normal shot.